An expedition of 26 scientists arrived at Akademik Vernadsky station. 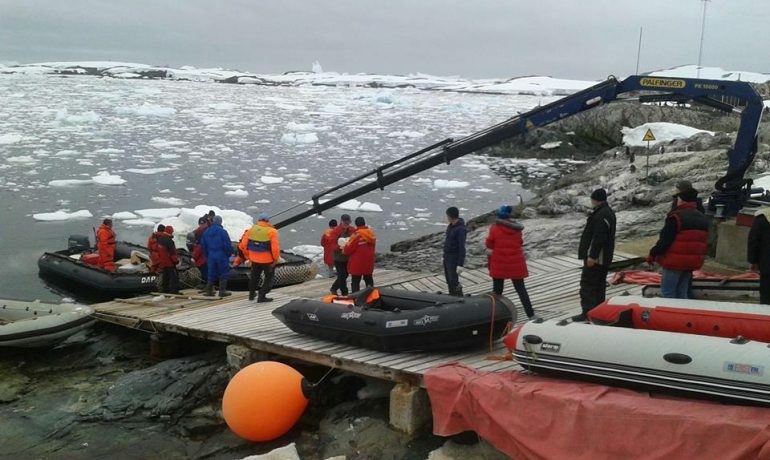 23 researchers arrived through the Chilean port of Punta Arenas, the Drake Passage, and the King George Island, where the expedition members have taken samples along with Chilean colleagues at Chilean Eduardo Frei Station, as well as have loaded a lot of equipment that has been stored here since last December, when a strong sea ice did not allow the vessel to reach Vernadsky. Three more Ukrainians overcame the path from the Argentine Tierra del Fuego on sailing yachts to collect samples of plants and soils on deserted islands around the Antarctic Peninsula on the way to Vernadsky. According to the head of the station, Viktor Sytov, currently it is a little bit crowded in Vernadsky premises, because the station is designed for a slightly less number of people, but all have settled down and have already started their work. By the way, Oksana Savenko is one of the first two women in the XXI century that will winter at the Ukrainian Antarctic station. The second woman – the doctor of the 24th UAE Natalia Babiy – will arrive at the end of March. Until now, gender equality was not a virtue of Ukrainian Antarctic Expeditions: the last time women wintered at the station in 1997-1998 (meteorologists Svitlana Krakovska and Liudmyla Mankivska as well as the cook Galyna Kolotnytska). Today, four woman researchers are working as part of the seasonal team, which will come back to Ukraine in two months. Dr Evgen Dykyi, Director of the State Institution National Antarctic Scientific Center, emphasizes that for the first time in 18 years, Ukraine sent to Antarctica a large seasonal group of 26 scientists; the period of research is also the longest over these years – more than two months. “Scientific tasks are significantly expanding both on the subject and geographically. We are trying to cover the research of Antarctic ecosystem from viruses to whales, and from sub-Antarctic islands to the Arctic Circle,”said Evgen Dykyi. Next PostThe Ukrainian Antarctic station is 23 years old. How did everything happen?